In this lesson, you will learn how to use and enable Filters for the Gradebook. 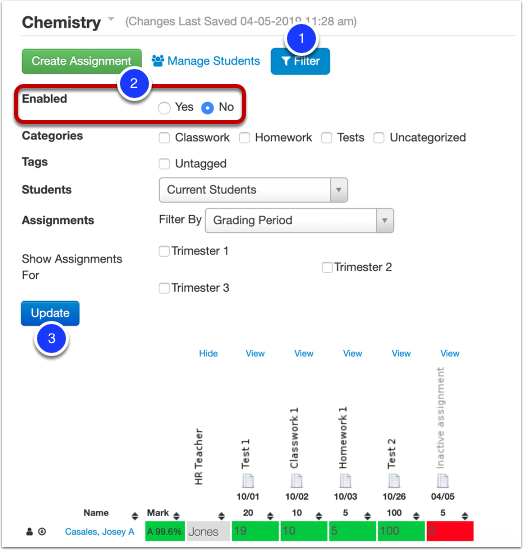 Filters limit the assignments you are viewing by date range, categories, or tags. This is useful for filtering out assignments once a new term has started. This way assignments from the previous term do not show and overall grades are calculated by assignments in the current term only. Select Filter at the top of the page. Select any filters you wish to use from Categories, Tags, Students, or Assignments. Select Filter at the top of the page. 1. Select the Filter drop down from the sub-navigation bar to either Enable or Edit Filters. 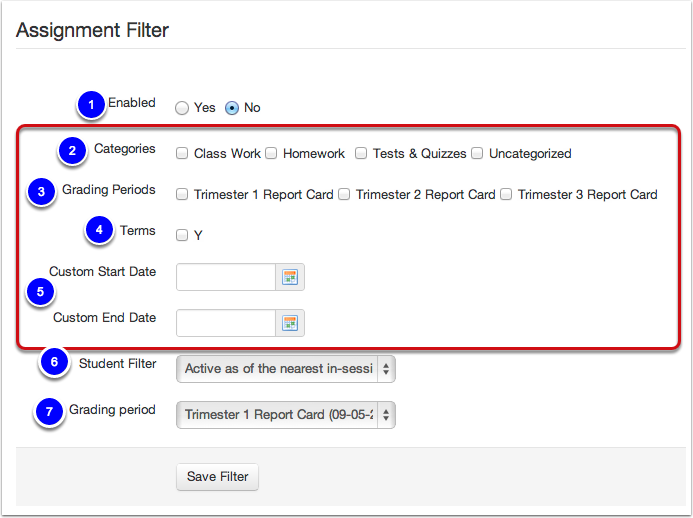 Selecting Enable Filter will automatically filter assignments from your Gradebook based off already created Filters. If no Filters have been created, see step below. 2. Select Edit Filter to show various filter options for the selected class. Enable Filters gives you the option to turn Filters on and off. Select one of the areas in the box (see screenshot above) to use as your filter. Either filter by Categories, Grading Periods, Terms or a Custom start/end date. Categories allows you to filter assignments by category if you created these. Grading Periods allows you to filter assignments by Quarters, Progress Report, Progress Grade, and Final Grade. Terms allows you to filter assignments by 1st Semester and 2nd Semester, etc. 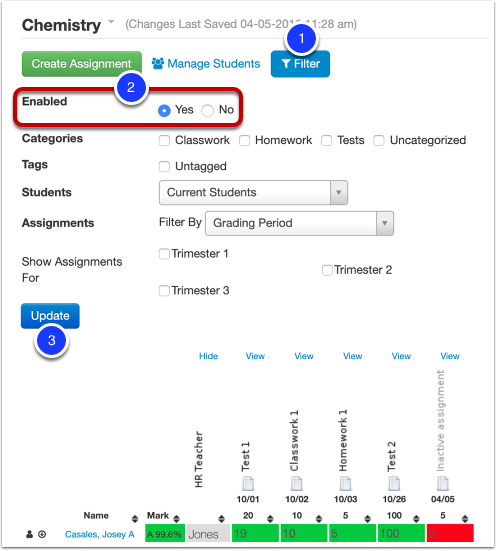 Custom Start/End date allows you to set the date for the assignments you want to see displayed in your gradebook. Student Filter allows you to select which students you want to show in your gradebook. For example: I want to see a student who left my class and is no longer on my roster, select the option "All students" or "Active within the grading period." Grading Period allows you to save the filter for the grading period you have selected. Filters limit the assignments you are viewing by date range and/or Categories. A good example of utilizing filters is to filter out assignments once a new term has started. This way assignments from the previous term do not show and overall grades are calculated by assignments in the current term only. Posting Grades Note: While the Filter may limit Your Views to certain assignments. When posting grades, only assignments within the grading period will post to the Report Grades and/or Final Grades.